From the A40/M40, leave at Junction 1 signed for "Gerrards Cross", keep following the road signs for "Gerrards Cross" on "Denham Roundabout" and over one set of traffic lights, then look out for the right hand turn for the A413 to "Amersham". Follow this road for about 5 miles and look for the right turn at the roundabout signed for "Berkhamsted" (A416). Follow the road up the hill into "Amersham on the Hill". Keep following the road signs through "Amersham on the Hill" for "Berkhamsted" and "Chesham" (A416), Christmas Tree Farm is on the right hand side of the road at the bottom of the hill just before you get into Chesham. From the M25, leave at Junction 18 for "Chorleywood" and follow the road signs to "Amersham". Follow the road signs through "Amersham" for "Berkhamsted" and "Chesham" (A416). 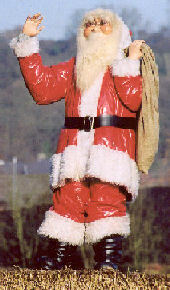 Christmas Tree Farm is on the right hand side of the road at the bottom of the hill just before you get into "Chesham". From the A41, leave at "Chesham" exit. At the roundabout, follow road signs for "Chesham". Follow this road for 3 miles into "Chesham" continue through Chesham following signs for "Amersham". On leaving Chesham, Christmas tree farm is on the left hand side of the road, 100 yards out of Chesham. Please note LT occassionally change the web address for these time tables -sorry. Chesham is the last stop on the Metropolitan line of the London Underground tube network. Trains leave Baker Street at least twice an hour and the journey takes around 45 minutes. In addition the Metropolitan line stops en route to Chesham at Harrow-on-the-Hill, Moor Park and Rickmansworth. Take the "Amersham" train and change for Chesham at Chalfont and Latimer. 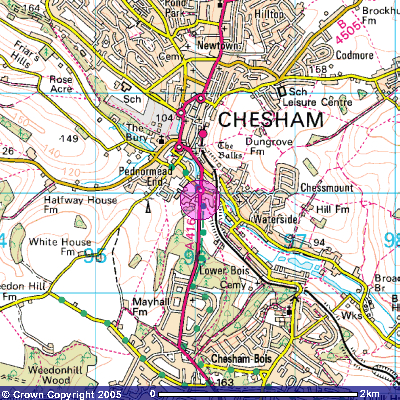 On arriving at Chesham station, walk across the station's drop off point and turn left down Station road. This will take you into Chesham High Street. Turn left and walk along the high street, and continue to follow this road, which is joined by traffic as it becomes Red Lion Street. Continue along Red Lion Street until you come across a mini roundabout at a fork in the road - take the right fork past 2 petrol stations opposite each other. Carry on straight over the large roundabout towards Amersham. 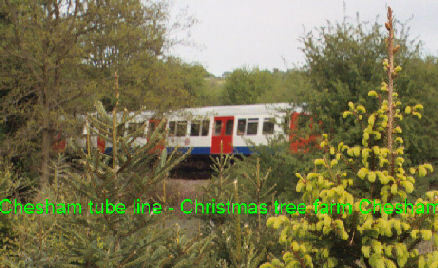 Christmas tree farm is on the left hand side about 80 yards out of Chesham.